Yes. It is the “attack of the killer tomatoes” month. I have so many at the moment that I can’t possibly use them all, so it is time to start preserving them. Note to self, do not plant 14 tomato plants next year! I’ll be making passata soon, but not yet. Today it will be relish. 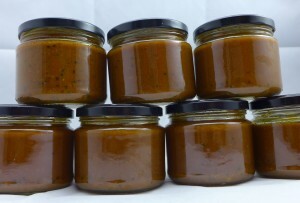 I love kasoundi, a big spicy indian flavoured tomato relish, so I have made up a batch that is big enough to use up some of my tomatoes. I will keep some of the relish for myself and give the rest away to friends. I used a mixture of large tomatoes and cherry tomatoes (of which I literally have hundreds if not thousands). This recipe was published in the Age newspaper years ago. I’ve changed it only by reducing the amount of salt. The original called for 60-90 grams, I’ve used only 50 grams. 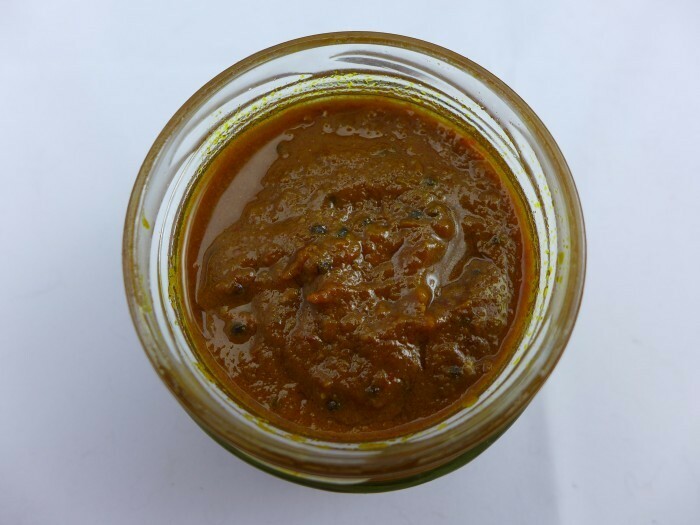 This relish is good on everything savoury. Pastries, pies, cheese, patties, burgers, sandwiches, roasted vegetables…are all improved by the zing of kasoundi. 2 kilos of ripe firm tomatoes chopped. There is no need to skin the tomatoes. You can also use diced tinned tomatoes. Heat the oil until smoking hot, and add the mustard, turmeric, cumin and chilli powder. Stir continuously and cook for a few minutes, taking care nothing sticks. Add the minced garlic, ginger and chilli and cook for another five minutes. Add the tomatoes, salt, vinegar and sugar, and cook at a simmer for 60 to 90 minutes or even longer. The kasoundi is ready when the oil comes to the top and the chutney is thickened. A friend of mine recently gave me a jar of Kasoundi, and I immediately opened it when I got home. It was lovely on my cheese sandwiches. Tonight myself and a friend from Hobart will be having it during our BBQ!! Glad you are enjoying it! It is yummy. The Kasoundi is fantastic! Seriously yum! Thank you! I am glad you liked it. I love that it is so easy to make. I adore kasoundi and will be trying this recipe when my tomatoes go crazy in a couple of months. Just thought I would add in a tip about garlic that I learned years ago: break the cloves off the head and cut just the tip off each clove. Put each clove in the microwave for 15 seconds on high. The cloves will steam in their skin and pop out – no need to peel and the steamed garlic is then so aromatic, flavoursome and easy to chop. You can experiment with the right length of time to cook your cloves – different microwaves and clove sizes might need different times. I generally find 15 seconds works for almost all size cloves in my microwave – even the really small ones, which seem to come out hard if I don’t give them the full whammy of time. Apparently Geoff Slattery wrote this recipe up in The Age – Epicurian – based on a recipe from a guy who used to sell it at his market stall in Cowes, Phillip Isl. Kasoundi, warm tofu slices and fried zucchini on toast… yum! I’ll come back and rate this when I have made it. Thanks for sharing!